Editorial in this a.m.'s News & Observer calls Republican Speaker of the NC House a bully for his recent comments about our state's public school teachers, both when he didn't know the microphone was on and when he did. "...does Tillis think teachers choose their calling in order to get rich?" asks the editorialist. "No one is that big a fool." No, but someone is that big a jerk, leading a platoon of jerks, and taking us all down the road to turning North Carolina into Mississippi. As a teacher, I'm continue to see the fallout from the historical lower than average pay in NC for teachers, and in Watauga, the high cost of living. Now, very few ASU graduates even consider teaching in Watauga, and many are looking to teach out of state. Compare salary scales from neighboring states. It will shock you. TN, VA and others invite teachers that are mobile and the best. With the shortage of jobs, schools select the cream of the crop. What does our state offer to new teachers? Low pay, little respect from lawmakers, frozen wages, void of bargaining rights. And Tillis has the audacity to verbally insult and bully teachers. 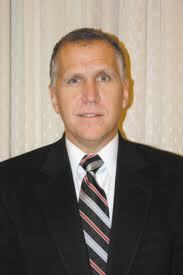 In his situation, I'd use corporal punishment on Tillis. Where is the paddle? Hold your ankles Thom.